Hey Aparna.. nice cake.. cool technique for the layering!! Cheers! Hey You are right, treat for the eyes indeed and i guess for the soul too ! Vanilla and chocolate compliment each other very well so it must be very tasty .Never did i imagine that its so simple and fun to make those stripes . Will definitely try this one soon with extra task of answering my 5 year old as to how i 'painted ' them !! Your cake looks beautiful! So glad you tried it. Thanks for linking to me. Cheers. 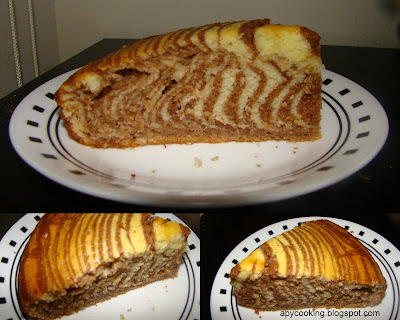 Zebra cake looks amazing My 1st time here, following your blog. Hey i baked this cake today :) thanx for introducing this to me . Lovely cake. I baked it last week too..zebra-ishness shows well in yours..
Wow looks so perfect.. I love zebra cake.yummm!!! Looks great!! I tried making this, but am not satisfied my the stripes.. gotta try again.. Try again, I'm sure you'll get it. WOW !! I am gonna be ur blog follower for sure ..
i tried this cake today ....it turned out awesome...!! That's great! Thanks for trying!